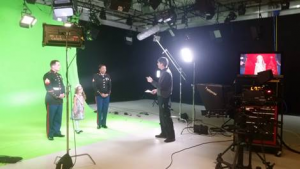 Author Matt LevertonPosted on June 2, 2015 Categories Cover Girl, Jr. Pre-Teen, kentucky, pictures, Royalty, WelcomeTags cover, girl, helps, jr, kentucky, lacrissa, lamar, nam, namiss, pageant, pageants, pre, sessions, teen, trainingLeave a comment on Lacrissa Lamar, Kentucky Jr. Pre-Teen Cover Girl, helped at the Training Session in Louisville. 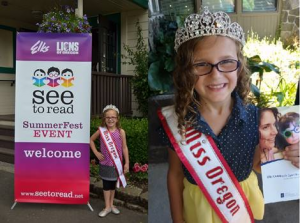 Author Matt LevertonPosted on May 20, 2015 March 30, 2016 Categories farewell, oregon, pictures, Princesss, Royalty, WelcomeTags back, ella, her, looks, nam, namiss, on, oregon, osborne, pageant, pageants, princess, queen, YearLeave a comment on Ella Osborne, 2014 Miss Oregon Princess Queen, looks back on her year! 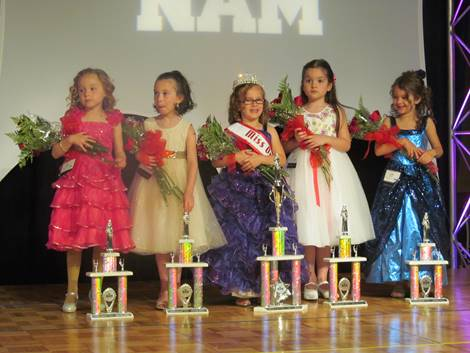 Kimberly Cox, Tennessee Pre-Teen Queen, has been representing National American Miss well! Kimberly Cox, Tennessee Pre-Teen Queen, has been representing National American Miss well! 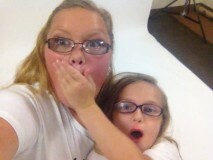 She recently performed the role of Fannie in A Southern Christmas Carol with the Robertson County Players. Kimberly has been a member of this theatre group for 6 years, and loves singing and performing on stage. 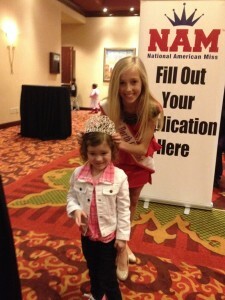 She was later invited to volunteer at a fundraiser pageant for Children’s Miracle Network Hospital. 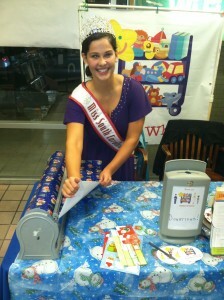 Kimberly worked registration, organized contestants, and had the privilege to crown and award the winners. During Valentine’s Season, Kimberly gave back to her community by visiting with residents at Springfield Heights with the United Way. She delivered Valentines with candy and played bingo. 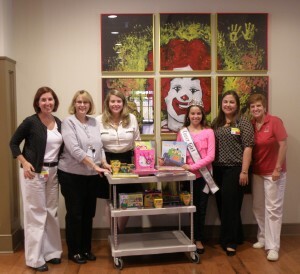 Kimberly is a proud representative for the United Way of Robertson County. Some of Kimberly’s other exciting appearances include a recent trip to the State Capitol, where she met Governor Bill Haslam, and also attended the NAM Kentucky State open calls. At the open calls, Kimberly met many future contestants aspiring to gain confidence and leadership skills, just like she has. Kimberly is an involved 7th grader at Greenbrier Middle school. She is a 4.0 student, member of beta club, and student council. She mostly enjoys spending her time playing softball with her team, the Lady Cats. 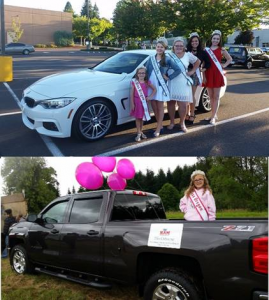 Author Matt LevertonPosted on April 9, 2015 Categories Community Service, General Information, kentucky, Open Call, pictures, Pre-Teen, Royalty, tennessee, WelcomeTags calls, cox, governor, haslam, helped, kentucky, kimberly, met, nam, namiss, open, pageant, pageants, pre, queen, teen, tennessee, United, Way, with, workedLeave a comment on Kimberly Cox, Tennessee Pre-Teen Queen, has been representing National American Miss well! 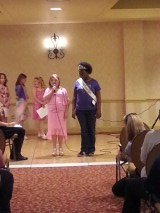 Jeanae Ganther,2013 Miss Florida Pre-Teen, gives words of encouragement to this years contestants. 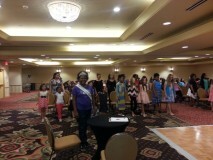 Jeanae Ganther,2013 National American Miss Florida Pre-Teen Queen, gives words of encouragement to this years contestants. Hey Girls, This past year has been unbelievable! I’ve gained so much confidence because of NAM. 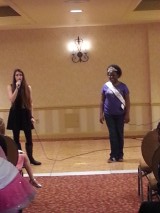 I’ve met so many talented girls and made some new friends throughout this journey. I’ve volunteered at “Dare to Care” Kitchen, Horizon Assisted Living, donated school supplies to my former elementary school, participated in March of Dimes and Komen’s Breast Walk.I also had the opportunity to travel to Jacmel, Haiti with Hope for Humanity to do mission work and deliver school supplies and personal hygiene items. 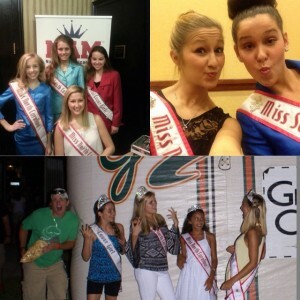 At state pageant weekend, be yourself, meet as many girls and have fun! At Nationals, you’ll meet more girls and make more friends. We had theme parties each night! We went to Disneyland, Hollywood, and had a Thanksgiving Banquet with the NAM families. Let’s not forget the shopping, dining, mentoring, beauty sleep, and competitions. Enjoy every moment, take lots of pictures. I thank NAM, for the opportunity of a lifetime, especially my State Director, Matt Leverton. Crowned of not, this is a learning experience. Remember, you always take something back with you; it’s up to you to make it positive. To my successor, do not consider winning as the end, but the beginning of bigger and better things. 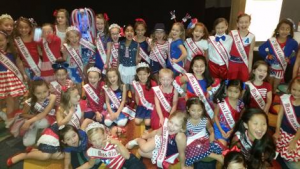 Author Matt LevertonPosted on July 9, 2014 March 31, 2016 Categories farewell, Pageant Stories, pictures, Royalty, South Florida, WelcomeTags contestants, florida, for 2014, ganthier, jeanae, nam, namiss, pageant, pageants, pre, queen, teen, wordsLeave a comment on Jeanae Ganther,2013 Miss Florida Pre-Teen, gives words of encouragement to this years contestants. 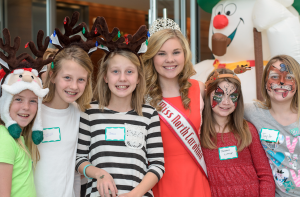 Kaitlyn Connell, 2013 Miss North Carolina Pre-Teen cover girl, looks back over her year. 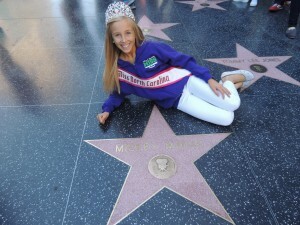 Kaitlyn Connell, 2013 National American Miss North Carolina Pre-Teen cover girl, looks back over her year. 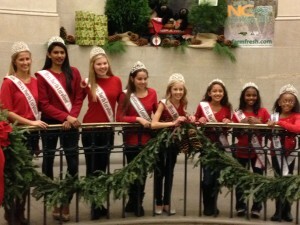 I can’t believe it has been one year since I have been crowned your 2013 Miss North Carolina Pre-Teen Cover Girl. 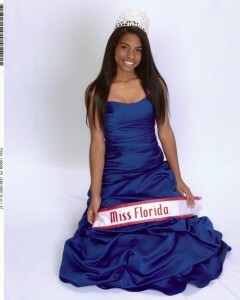 I was so honored to be able to represent my state and help my community. 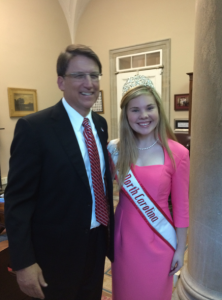 I have had so many opportunities such as traveling to our State Capital and meeting Governor Pat McCrory. 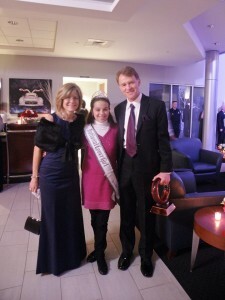 Being invited to the Ambassador’s Ball hosted by Mercedes Benz of South Charlotte, where I met The Ambassador of Switzerland, Manual Sager and his wife, former U.S. Representative Sue Myrick and the Mayor. I also had the opportunity to meet Bob Beyer, the Assistant Coach for the Charlotte Bobcats. I volunteered at different organizations such as retirement homes, The Ronald McDonald House of Charlotte, The Allegro Foundation of Charlotte …a Champion for Children with Disabilities, which I hold very near and dear to my heart. 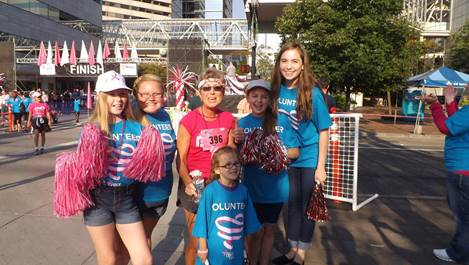 I walked with my sister queens in the Susan G. Komen Race for the Cure. 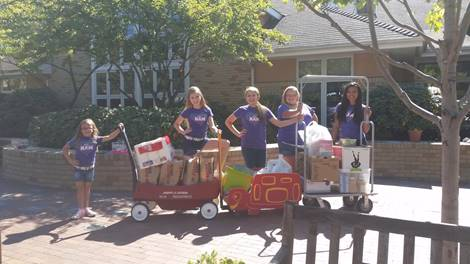 I handed out the books and stuffed animals donated by the contestants to WSOC-TV School Tools, Shands School of Matthews, The Ronald McDonald House of Charlotte and Kids-R-Kids. 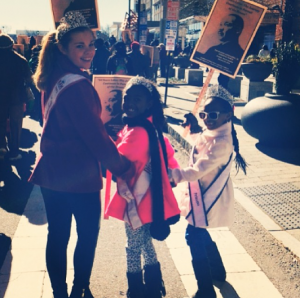 I also had the opportunity of being in parades. Then it was time for Nationals. Nationals was truly the best week of my life. What an awesome experience! 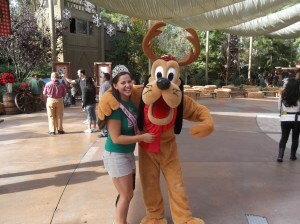 I totally enjoyed hanging out with my NC sister queen, Brandi at Disneyland, sister’s forever! Thank you for showing us around! And also touring Hollywood was so much fun. 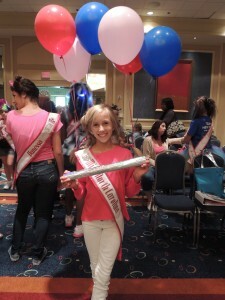 While I was at Nationals, I won National American Miss National Pre-Teen Cover Girl and got to walk the red carpet. I have made so many new friends this year and was able to be involved in so many opportunities. 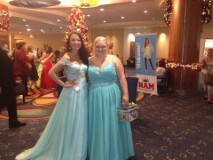 I totally enjoyed working at the NC Open Calls and meeting all the new contestants. 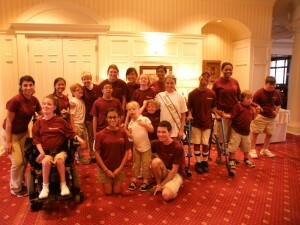 I also was invited to perform at the Opening Ceremonies of The Special Olympics of NC with The Allegro Foundation. To my sister queens, Niyah, Skyla, Marindia, Brandi, Alexandra, Shivali, and Megan, I have been so blessed to have shared this journey with all of you. 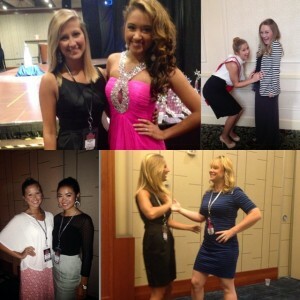 To Alex, Miss South Carolina Pre-Teen, thank you for being so much fun to be around, you are my life-long sister and I love you so much. To Mom and Dad, thank you so much for supporting my dreams and never giving up no matter how busy this journey was. And to Dad for always making times fun! To Mr. Matt Leverton, thanks for being the best state director ever and being so supportive of all of us. Thank you and your team for making this organization so much fun. To my successor, this will be the best year of your life, embrace the moment. 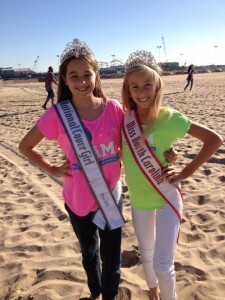 Until next time, I am and forever will be your 2013 Miss North Carolina Pre-Teen Cover Girl Kaitlyn Connell. 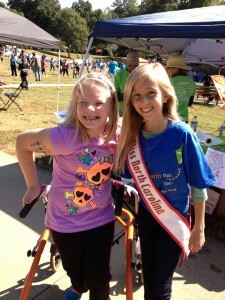 Author Matt LevertonPosted on July 1, 2014 March 31, 2016 Categories Cover Girl, farewell, north carolina, Pageant Stories, pictures, Royalty, WelcomeTags at, back, carolina, connell, cover, girl, her, kaitlyn, looks, nam, namiss, north, pageant, pageants, pre, teen, YearLeave a comment on Kaitlyn Connell, 2013 Miss North Carolina Pre-Teen cover girl, looks back over her year. 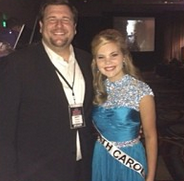 Megan Ebert, National American Miss North Carolina says farewell. 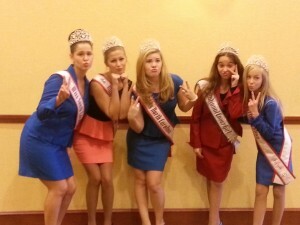 Megan Ebert, National American Miss North Carolina Miss Queens says farewell. 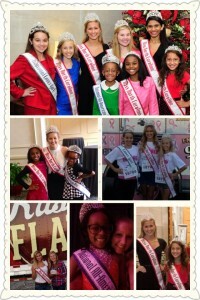 My year as the National American Miss North Carolina is one that I will never forget. I was able to spend time and get to know some of my sister queens and other state royalty at open calls for NC and SC, as well as at Nationals. Having the privilege of meeting our Governor Pat McCrory and the Burlington Mayor Ronnie Wall. I had a blast volunteering and helping raise funds for the Susan G. Komen Race For The Cure with two of my sister queens, as well as delivering bears and other personal items to the Ronald McDonald house for the families. I was able to enjoy a beautiful summer evening with some of sister queens at a Greensboro Grasshopper Baseball Game at their annual Princess Night. Nationals was an experience I will never forget. 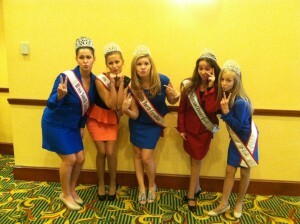 Placing in the top 10 at Nationals was a true blessing and the friendships made during that week will last a lifetime! To my director Matt and his wonderful staff, thank y’all so much for all y’all have done for me and my family. 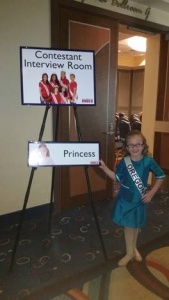 It’s hard to believe that nine years ago I stepped foot on the National American Miss stage for the very first time as a shy pre-teen, and very soon I will stand on the same stage for the last time as a confident, growing young woman! To every young lady who competes in National American Miss, no matter what age division your in or what state you reside in. Always remember that you are fearfully and wonderfully made, and you are beautiful just they way you are! Never given up your hopes and dreams, because if you can dream than you can achieve it! I look forward to meeting all the NC contestants this week!! 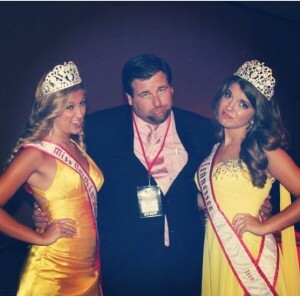 Author Matt LevertonPosted on June 25, 2014 March 31, 2016 Categories farewell, General Information, north carolina, Pageant Stories, pictures, Royalty, WelcomeTags carolina, ebert, farewell, megan, miss, nam, namiss, north, pageant, pageants, queen, saysLeave a comment on Megan Ebert, National American Miss North Carolina says farewell. 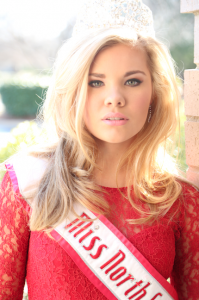 A warm and welcome word from your 2013 Miss North Carolina Jr. Teen Alexandria Murphy! I was truly blessed to be crowned the 2013 Miss North Carolina Jr.Teen! This year is one I will never forget. I was fortunate to have been visiting royalty at some of the state pageants, spending time with my sister queens at open calls and workshop sessions throughout North Carolina. 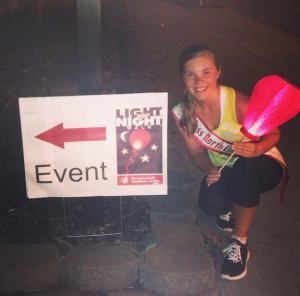 My volunteer opportunities consisted of the American Heart Association, Night the Light Cancer walk, the Little Elf Workshop, Dress for Success, the Ronald McDonald House, Learning Together, Halloween 5K Hustle, The Girls Rising event, and much more! These opportunities also afforded me the chance to meet the mayor of Raleigh, Mrs. Nancy McFarlane and the Governor of North Carolina, Mr. Pat McCrory. Nationals was a blast! 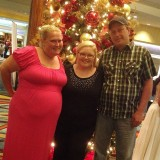 I met friends from all over the Unites States. The day at Disney, Hollywood, Universal Studios and window shopping on Rodeo drive are wonderful memories. I was fortunate to have placed in some optionals. Placing top 10 in the Nation was the icing on the cake and a wonderful blessing from God! To all the girls competing: Good luck, be yourself, and have fun because the weekend will go by fast! You will have an amazing time and make friends for a lifetime! Make sure to never give up no matter what! This was my fourth try for the North Carolina state title! Just remember the words of Walt Disney: “If you can dream it, you can achieve it!” I am so excited to meet you and spend a great weekend together! 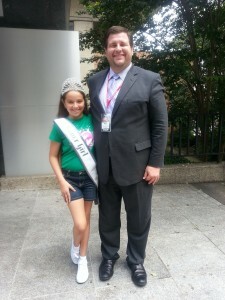 Author Matt LevertonPosted on June 23, 2014 March 31, 2016 Categories farewell, north carolina, pictures, Royalty, WelcomeTags 2014, alexandria, carolina, contestants, jr, murphy, nam, namiss, north, pageant, pageants, queen, teen, welcomesLeave a comment on A warm and welcome word from your 2013 Miss North Carolina Jr. Teen Alexandria Murphy! 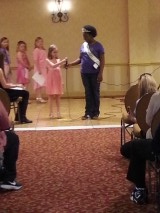 Royalty Letter from Brandi Alden, Miss North Carolina Pre-teen! Royalty Letter from Brandi Alden, National American Miss North Carolina Pre-teen Queen! It’s hard to believe a year has already passed. My experience has been incredible – from the moment I was crowned to each and every day since. 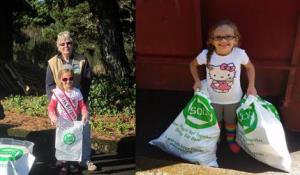 I have had the opportunity to work fun stations for the Easter Seals Foundation, walked for the Susan G. Komen Foundation, made goody bags and candy necklaces for Bright Blessings to support homeless children and families and collected food and supplies for my own charity, B.R.A.Y.S. Love (Bringing Rescued Animals Your Support). 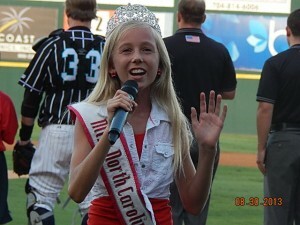 I have entertained for many local pageants and was invited to sing the National Anthem for the Charlotte Knights and Davidson College. Nationals was a blast!!! From going on a Hollywood Tour to visiting Mickey in Disneyland, I made so many friends and memories to last me a lifetime!! 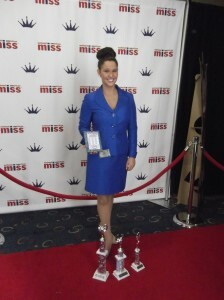 I was also honored to have received 2nd RU Naional Casual Wear Modeling and 3rd RU National Spokes Model. A big thank you to Mr. Matt Leverton, my awesome state director!! You have made this such a special year always making every girl feel special!! To my successor, the impact you make on the lives of those around you depends on how you utilize the title given to you so wear it proudly and above all make lots of memories and have fun!!!! 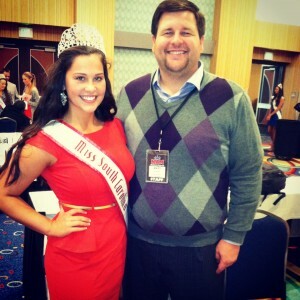 Author Matt LevertonPosted on June 21, 2014 March 31, 2016 Categories farewell, north carolina, Pageant Stories, pictures, Royalty, WelcomeTags Alden, brandi, carolina, contestants, Letter, nam, namiss, north, pageant, pageants, pre, queen, teen, toLeave a comment on Royalty Letter from Brandi Alden, Miss North Carolina Pre-teen! 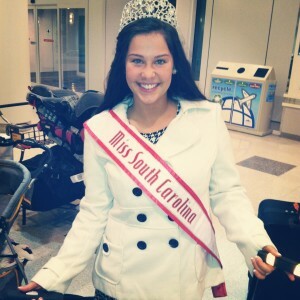 Laney Edwards, says goodbye to her year as the 2013 Miss South Carolina Jr. Teen! 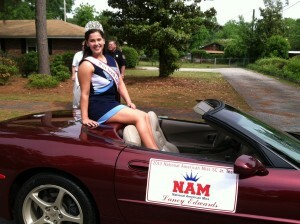 Laney Edwards, says goodbye to her year as the 2013 National American Miss South Carolina Jr. Teen Queen! I can’t believe that my reign as SC Junior Teen is already coming to an end; it seems like only yesterday that I heard my name announced as the winner! 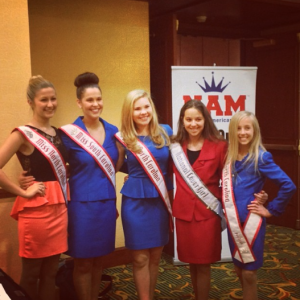 My year representing NAM has flown by in a whirlwind of traveling (across the country-literally! 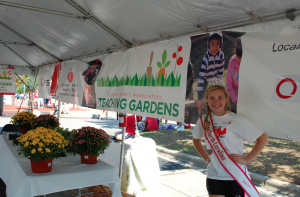 ), volunteering, and making appearances and memories. Being a NAM queen has been a privilege and an honor that I will always cherish, and I am thankful to have had this amazing opportunity. 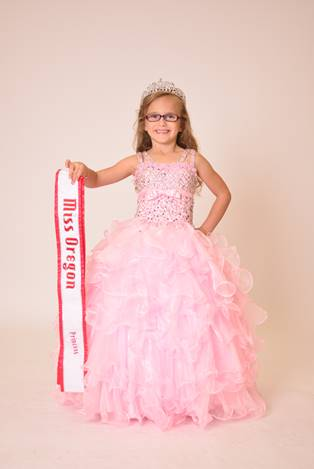 I’m so excited to welcome all the new contestants and look forward (with a smile and tears) to crowning my successor! A lot of girls have asked what advice I have for pageant weekend, so here goes: Make lists for everything, and check them off as you go. Come prepared; have all your paperwork ready to turn in. Do as many optionals as you possibly can (It’s so worth it!). Don’t be nervous. Smile at the judges and the audience. Speak clearly and use complete sentences during your interviews. Most importantly, HAVE FUN and BE YOURSELF! Be confident in the knowledge that you are unique and beautiful, made in the image of your Creator. And if you’re the girl who is fortunate enough to walk away with the crown— Count your blessings and enjoy every moment of your reign because, take it from me, it will be over sooner than you think. Good luck to everyone, and God Bless! 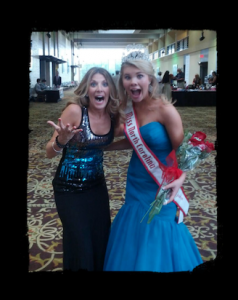 Author Matt LevertonPosted on June 12, 2014 March 31, 2016 Categories farewell, pictures, Royalty, south carolina, WelcomeTags and, back, carolina, contestants, edwards, her, jr, laney, looks, nam, namiss, on, pageant, pageants, queen, south, teen, welcomes, YearLeave a comment on Laney Edwards, says goodbye to her year as the 2013 Miss South Carolina Jr. Teen!